Hong Kong, real estate analysts, are finally coming to terms with a slowdown in the economy as a trade war with the US escalates. They warn Hong Kong's Central district could plunge by up to 10% this year, growth in overall rents should cool further, and home prices might collapse 40% in two years, according to Cushman & Wakefield analysts. Demand for retail property in Central, known as Hong Kong's business and retail district, crammed with skyscrapers and swanky malls and luxury hotels, has remained relatively weak, with vacancy rates rising to 7.1% this quarter from 4.3% in the April to June period according to the consultancy firm, as per a new report from South China Morning Post. Kevin Lam, head of retail services at Cushman, said the business environment in Hong Kong remains cloudy in the coming quarters, despite the new addition of the Express Rail Link, which should boost mainland tourist volume. "Trade tensions and potential threats such as depreciation of the yuan, which has come down by 8.7% against the Hong Kong dollar since April, and a broad reduction of import tariffs in the mainland since July, would undermine the [appeal of goods sold in] Hong Kong," said Lam. The analyst warned that retail store rents could drop by 10% in Central by end of 2018. In greater Central, which includes Admiralty and Sheung Wan, the world's most expensive business districts, office market rents start at HK$137.9 per square foot, growth in this segment continued to ease from 2.4% in the first quarter to .70% this quarter, according to Cushman. "Business activity and expansion slowed a bit in view of trade tensions and their possible impact," said Kevin Hemshall, head of office services at the firm. "Liquidity controls in China have limited [the expansion of financial services] companies." Hemshall said office space demand had dropped off, including 117,633 sq ft. in greater Central and 94,380 sq ft. in Wan Chai and Causeway Bay. Other reasons for slowing demand in office space could be high rents, low supply, and liquidity issues amid soaring interest rates. Analysts also warned the impact from the trade war on the commercial real estate industry would be felt sometime in spring 2019, and that growth in rents would wane severely. For one of the most overvalued real estate in the world, sentiment has drastically shifted to fear -- indicating a possible turning point in the economy is dead ahead. Negativity also crept into the private housing estate segment, more specifically, an area called New Territories West dropped by -2.55% in the past twelve weeks, Hong Kong Island and New Territories East declined by 2% and .56%, respectively, according to official data on Monday. An outlier, Kingswood Villas, a private housing development of 15,808 units, one of Hong Kong's most significant private housing estates, crashed -15% in the same period. Six in 10 Hongkongers were "pessimistic" about the economy in the next two quarters, while 40% thought local home prices were due for a correction early next year under escalating trade wars with the US, according to the latest Hong Kong Research Association's polling data. Last month, the Hong Kong dollar saw its most massive spike since 2003. The move reverberated across the city's money market instruments, with interbank rates rising by the most since the 2008 crisis. The shock jump in the currency and increasing interbank rates is a troubling sign for its bubbly commercial and residential real estate markets. Citigroup and CLSA have warned of a reversal in Hong Kong real estate prices on expectations that mortgage servicing costs will soar. A currency peg with the US dollar, open financial borders, and a hot economy were some of the catalysts that transformed Hong Kong into the hottest real estate market in the world, over the last decade. 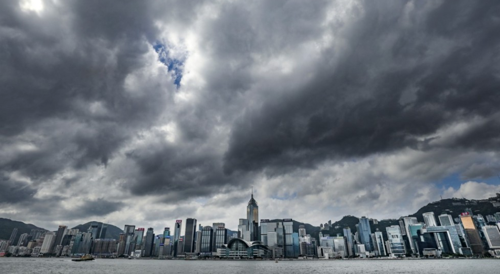 Now that analysts from Cushman & Wakefield are calling a top in Hong Kong real estate markets. Why does this matter to you? 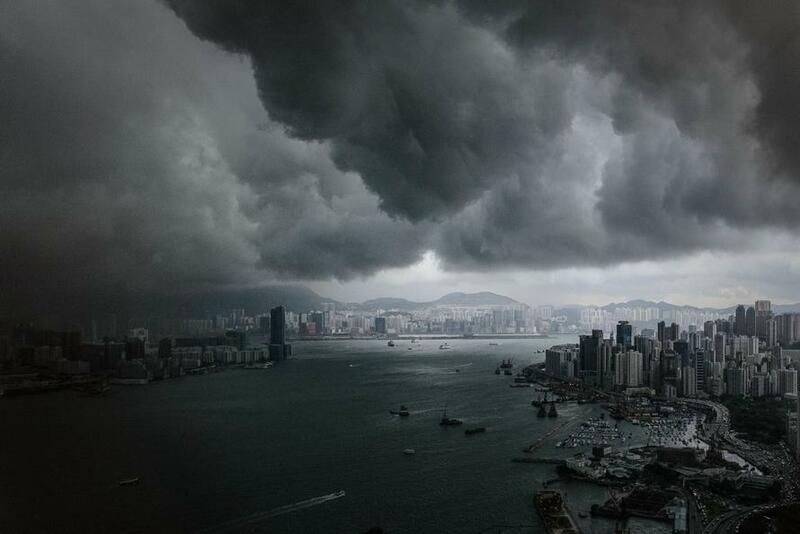 Well, Hong Kong is a global barometer of economic health. As we have said before, trade wars are disrupting global supply chains that are now slowing global growth momentum. Soon, here in the West, we will see a global growth scare (maybe the IMF overnight gave us a preview of what is to come), which will ultimately reprice risk assets. Storm clouds are gathering.